Growing up with the Internet gives today’s children a very unique view on the way the world works — one that is vastly different from that of older generations. These kids, the ‘digital natives,” are raised with modern technology deeply embedded into their lives, and form a natural understanding of its benefits. This deeply rooted acceptance gives kids a unique perspective on how technology can be further used to make our lives easier, and helps researchers predict future needs for innovation. What can we learn from the digital natives? We asked this question back in September, and it’s one that research firm Latitude sought to answer with its KIDS – Kids Innovation Discovery Series initiative. Now, Latitude is back to find out how technology, specifically robotics, can be used to inspire new opportunities for learning and creativity. 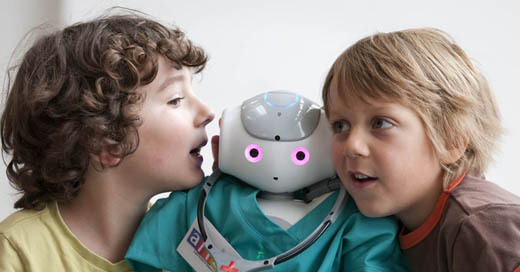 With children so easy to embrace robotics, it’s clear that there’s a ton of potential for integrating intelligent technologies into learning environments. Besides, the idea of “exploring and creating” sounds a heck of a lot better than answering true/false questions out of a booklet. Clearly there are tons of new and interesting ways to learn, and technology is, in many ways, responsible for this. While this dreamy perspective is partially the result of childhood imagination (something kids from any generation can have), it is clear that kids are eagerly anticipating new ways that tech can enhance their lives. Sure, it’s easy to dismiss how children look forward to the future and dream without inhibitions, but that’s exactly what some of the greatest innovators of our time have done. Children don’t just react, they imagine, and that’s why this study can’t be overlooked.